Budget proposals presented by the President and members of Congress represent different approaches to the issues Americans identify as top priorities: education, health care, climate change, and other domestic investments, as well as making sure the wealthy and corporations pay their fair share. You'll learn what the budget proposals mean for policy priorities in Congress - and how they stack up against what Americans say they want. 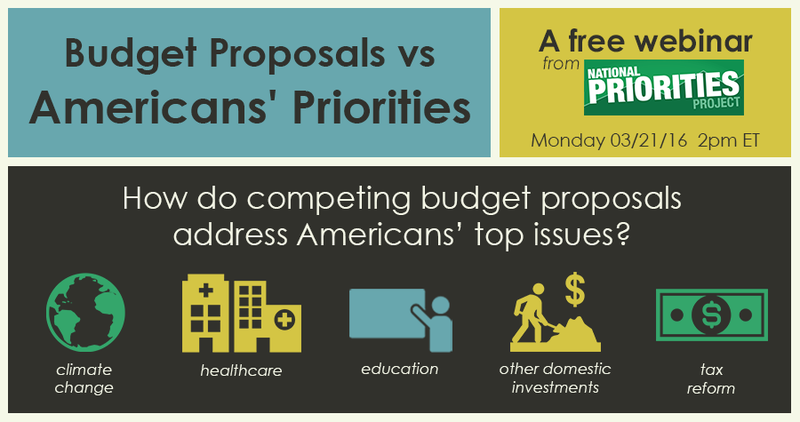 In this webinar, National Priorities Project Senior Research Analyst Jasmine Tucker will explain the differences between the major budget proposals and share information about how you can influence the budget to shift our nation’s priorities.